State Department briefings are about to get a lot less fiery, with spokeswoman Jen Psaki, famous for sparring with reporters, geographic gaffes and policy blunders announced she will be moving to the White House in April. Lee was most likely referring to many Russians, who have made “Psaki” into a household term mocking US foreign policy, thanks to the State Department’s spokeswoman often outlandish claims about the alleged “Russian aggression” in Ukraine. 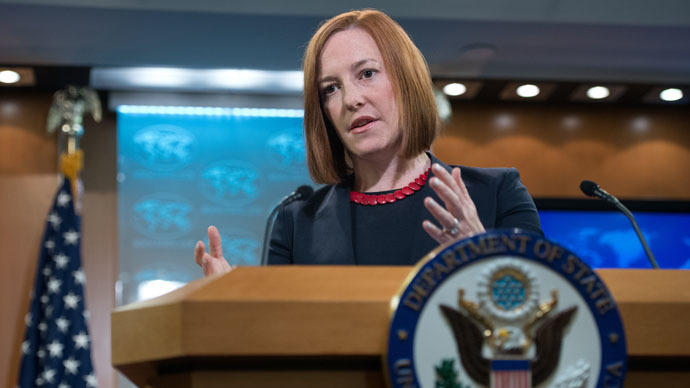 Though the Russian public frequently mocked her in the social media, they banded together in a campaign to #SavePsaki when they mistakenly assumed she had been fired last summer. A popular comedy show on Russia’s NTV network is called “Psaki at Night,” with the host Mikhail Gendelev often satirizing Western diplomats while a framed photo of Psaki hangs above his desk. Meanwhile, Psaki’s departure from State leaves Marie Harf as her likely replacement.